"Damask Red" was the second most popular color for the MGB GT V8 model. Aconite dark purple BLVC 95 98 74-75 Stnd. Black black BK 1 79 74-76 Opt. Opt. Black Tulip 3 very deep purple BLVC 25 5 73 only Stnd. Stnd. Blaze orange BLVC 16 147 73-75 Stnd. Stnd. Bracken brownish orange BLVC 93 154 73-76 Stnd. BRG + Gold 4 dark racing green BLVC 25 1 75 only Stnd. Bronze Yellow yellow ochre BLVC 15 26 73 only Stnd. Brooklands Green very dark racing green BLVC 169 17 74-76 Stnd. Chartreuse pale yellow BLVC 167 19 75-76 Stnd. Citron greenish yellow BLVC 73 267 73-74 Stnd. Damask Red light burgandy BLVC 99 472 73-76 Stnd. Stnd. Ermine White purest white BLVC 243 1 75-76 Stnd. Flame Red bright red BLVC 61 1 73 only Stnd. Flamenco Red scarlet BLVC 133 147 75-76 Stnd. Glacier White bluish white BLVC 59 513 73-76 Stnd. Opt. Opt. Green Mallard dark green BLVC 22 15 73-74 Stnd. Stnd. Harvest Gold golden beige BLVC 19 183 73-74 Stnd. Stnd. Limeflower yellowish green BLVC 20 2 73 only Stnd. Mirage greyish mauve BLVC 11 17 74 only Stnd. Police White off white BLVC 1024 2 73-74 Stnd. Stnd. Sandglow goldish caramel BLVC 63 8 75-76 Stnd. Tahiti Blue bright blue BLVC 65 90 75-76 Opt. Opt. Teal Blue med/dark blue BLVC 18 244 73-74 Stnd. Stnd. Tundra olive green BLVC 94 92 74-76 Stnd. Unknown 5 ? ? 1 75-76 ? ? 1) Only navy and ochre trim colors were offered in '73. Only black and autumn leaf trim were offered from '74-'76. 2) Number of cars built in each color was calculated by former MG employee and V8 enthusiast Geoff Allen from MG logs. Geoff also noted that factory employees confused tahiti and teal blue in some cases. 3) Apparently the only paint color that was listed at a premium price was Black Tulip. 4) One special 1975 V8 was built with a two-color paint job, consisting of "New Racing Green" and gold, with black interior. 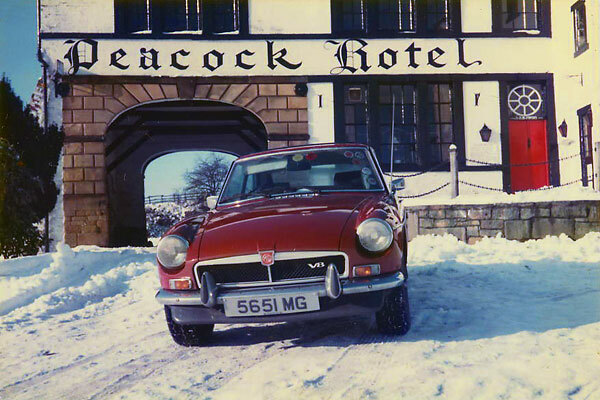 5) Per Geoff Allen, the factory's "Despatch" office failed to note the color of exactly one rubber-bumper MGB GT V8. 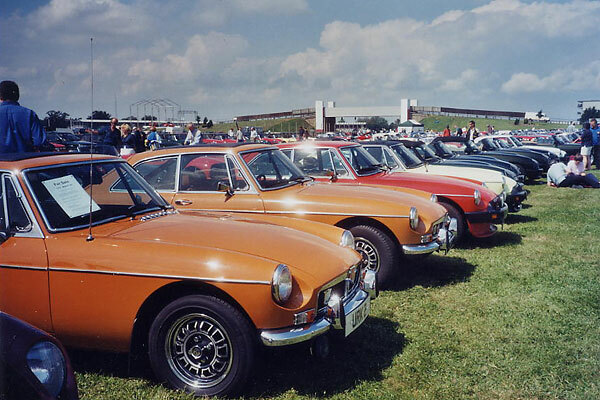 6) The total number of MGB GT V8's is generally reckoned as: "chrome bumper" = 1862 cars, "rubber bumper" = 739 cars. but Glacier White was most popular (513 cars). 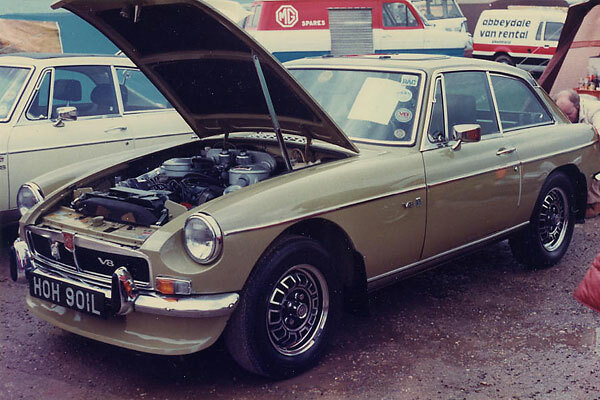 Only about three percent of MGB GT V8's were black. Limeflower wasn't a very popular color (only two sold!) but it photographed well in black-and-white. 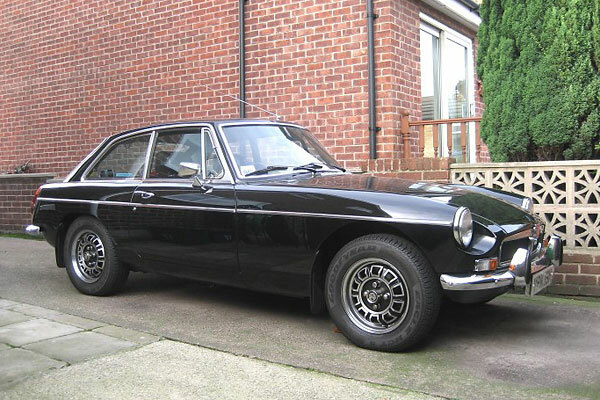 This particular car appeared in many of the original black-and-white MGB GT V8 publicity photos. but this number would have been much higher if the MGB GT V8 had been sold in North America!